A still image taken from video shows a close up of the the destroyed Grand al-Nuri Mosque of Mosul in Iraq, June 21, 2017. 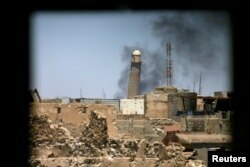 Mosul’s iconic al-Nuri mosque and its leaning minaret, known as al-Hadba, or “the hunchback,” are no more, destroyed by the Islamic State as Iraqi forces worked to eradicate the terror group from one of its last strongholds in the city. “Blowing up the al-Hadba minaret and the al-Nuri mosque amounts to an official acknowledgement of defeat,’’ Iraqi Prime Minister Haider al-Abadi proclaimed via his Twitter account late Wednesday. The medieval mosque, also known as Mosul’s Great Mosque, had stood for more than 800 years and is where Islamic State leader Abu Bakr al-Baghdadi in 2014 declared himself caliph over parts of Iraq and Syria. Iraq’s military said its forces were within 50 meters of the mosque Wednesday night when IS militants “committed another historical crime by blowing up” the building, said Gen. Abdulamir Yarallah, overall commander of the Mosul offensive. Islamic State’s Amaq news agency issued its own statement with a counter narrative, accusing U.S. aircraft of destroying the mosque. U.S. and coalition officials quickly rejected the terror group’s assertions. “As our Iraqi Security Force partners closed in on the al-Nuri mosque, ISIS destroyed one of Mosul and Iraq’s great treasures,” Operation Inherent Resolve’s Maj. Gen. Joseph Martin said in a statement, using an acronym for the terror group. The al-Nuri mosque had held a special place in IS lore. Not only was it where IS leader Abu Bakr al-Baghdadi first revealed himself to the world, it was named after Nuruddin al-Zanki. Al-Zanki was a noble who helped fight the early crusaders and was a role model for Abu Musab al-Zarqawi, the founder of al-Qaida Iraq, which later became IS, said Daveed Gartenstein-Ross at the Foundation for the Defense of Democracies. FILE - Al-Hadba minaret at the Grand Mosque is seen through a building window in the old city of Mosul, Iraq June 1, 2017. “The leveling of al-Nuri Mosque and Hadba Minaret may have been a last ditch effort by IS to repel the Iraqi CTS advance and deepen resentment for the coalition,” said Jade Parker, a senior research associate at the Terror Asymmetrics Project on Strategy, Tactics and Radical Ideologies (TAPSTRI). “IS official propaganda has made a concerted effort to highlight the collateral damage of coalition airstrikes, including mosques,” Parker said, adding there are many in the region, including those who don’t support IS, who may be hesitant to believe the U.S. and Iraqi version of events. And within hours, IS sympathizers were spreading the Amaq claim on social media, many looking to incite supporters around the world. “It appears Amaq’s report that states the U.S. is responsible for bombing the mosque is being used as a disinformation tool, the aim being to try to motivate the group’s supporters in the U.S. to execute attacks,” said Michael S. Smith II, a terrorism analyst who specializes in the influence operations of IS and al-Qaida. “This [narrative] is being augmented by posts concerning this development on pro-Islamic State Telegram channels,” Smith said. The destruction of the mosque comes on the fourth day of an Iraqi offensive on Mosul’s Old City, backed by U.S.-led coalition forces. The Old City is the last district in Mosul that IS militants control following an eight-month long offensive by Iraqi and coalition forces on the city. Carla Babb at the Pentagon contributed to this report.